This page provides an overview of the 2015/16 Student collection (C15051). This should be used alongside the C15051 coding manual, which provides more detailed, technical information about the collection. For the C15051 Student record, we have adopted an agile approach to data collection. Functional components of the system are being released incrementally during the period leading up to full functionality being released by early August. This approach gives you more flexibility in when data can be submitted. This in turn provides a longer window for data quality checks to be made. Details of the contents of each release so far can be found in the Release History section of this page. For the C15051 collection you need to submit a single file containing full data. Each subsequent file you upload will replace the previous one. If you prepare your data in multiple *.xml files, our XML amalgamator tool will combine these records prior to submission. In previous collections, in order to populate the NCTL Performance Profiles, you needed to fully commit your data in order for these to be produced. 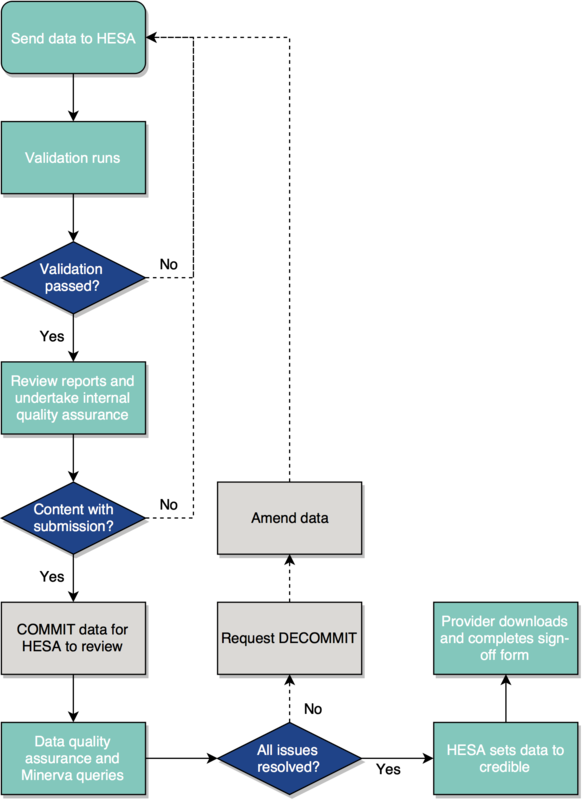 New for this year a full commit will not be required in order to populate these reports and meet the deadline. As long as valid data has been received that generates all possible reports (i.e. data does not fail Entry Profile or other fundamental rules) then data will also successfully transfer to the NCTL webservice. The redesigned quality rules webpage available from the coding manual has improved filtering and the facility to display further information. For further information on the new webpage, please view the FAQ document in the coding manual. A Higher Apprenticeship incorporates a work-based learning programme and leads to a nationally recognised qualification at NVQ levels 4, 5, 6 or 7 or equivalent. Code 'K' is used to identify students for whom the instance comprises any part of the study component of a Higher Apprenticeship Framework. Together with the UK funding councils, we have published a code of practice on data collection, which came into practice from the reporting year 2015/16. You will wish to ensure that your 2015/16 returns are prepared in a way that is consistent with the code. From 2017-18 it is proposed that students studying certain healthcare qualifications in England will no longer be supported by bursaries but will instead have access to mainstream student support supplemented by HEFCE grant. It is therefore likely that 2015-16 data on these professions will be of particular significance in informing allocations. You are therefore encouraged to pay particular attention to the coding of COURSEAIM, REGBODY and JACS for these courses. Providers in Scotland are reminded of the importance of providing information on care leavers through the CARELEAVER field. This information is required to monitor the participation in higher education of such students and to assist with the development of national policy to support this vulnerable group of students. Our new validation kit for the 2015/16 student data is now available to download. A user guide for the kit is available from the same link. The new kit has both increased functionality and a greatly improved processing speed. This gives you earlier access to validation processes and allows you to test against a wider set of quality rules. Please note that if you have a previous version of our validation kit it will not be updated to include the C15051 quality rules. You will need to download the new Validation Kit. We expect you to respond to all queries raised within the collection window. As a guide we expect that these queries should be answered within 5 working days. All reported issues relating to this collection are available under Known issues. These include any fixed and open issues that we are aware of. Full details of the derived fields that we use in analysis of the C15051 Student record data are available from the C15051 coding manual. COURSEAIM M71 is failing rule QR.C15051.Instance.GROSSFEE.22 but isn't in the list of COURSEAIMs that should be flagged by this error. Rules QR.C15051.Instance.STULOAD.14, QR.C15051.Instance.STULOAD.21 and QR.C15051.Instance.STULOAD.22 are all not triggering if the BRIDGE field is null. The sign-off form is displaying an incorrect date for the sign-off deadline. The REF1 table in the PGR chapter appears to be incorrectly displaying the total for UOA 06. QR.C15051.EntryProfile.POSTCODE.9 is currently triggering incorrectly where the outward part of the postcode crosses country borders. QR.C15051.QualificationsAwarded.OUTCOME.9 is triggering correctly but is displaying the rules that do have QualificationsAwarded.OUTCOME = D rather than those that do not. The WAIV1 table is displaying an incorrect record count. The RCUK2 table in the PGR chapter is displaying the correct column and row totals for the historic data but the breakdown is not correctly displayed. The Performance Indicators sheet is showing incorrect data for the current year. Static data from 2014/15 is correctly displaying. QR.C15051.Instance.ENDDATE.1 is underreporting. This will be corrected as soon as possible and all data will be reprocessed - this may result in validation failures. A problem has been identified with the XCLASS01 and XCLASSF01 derived fields. This affects data supply and the classification tables in the Qualifications Awarded chapter in the Credibility report. The REGB1 table in the Health and Social credibility report chapter is not displaying data correctly for Instance where REGBODY= 01-09. These figures are currently displaying as 0. QR.C15051.Instance.COMDATE.10 (report A warning) is not working correctly. It is currently only displaying records where the Instance.COMDATE returned in the current year is later than the date previously reported. Cases where the Instance.COMDATE has changed by less than 14 days but where this spans a month are also being raised incorrectly. QR.C15051.Instance.STULOAD.9 is working correctly but displaying the Course.COURSEAIM value in place of the sum of module FTE in the final column of the rule. Table WAIV2 (applicable to providers in Wales only) was unable to display data in some cases. Printing the Excel download of the report would currently use approximately 1500 pages due to a formatting issue. Please exercise caution if printing this download prior to a fix being issued. In the Excel download where a table has two data sources both are being labelled as '2015/16'. This is incorrect and the second data source should read '2014/15'. The display is correct in the online version of the report. Table FIN1 in the Student support chapter is displaying incorrect data; the count of awards is using the incoming data and the total amount is using the 2014/15 data. QR.C15051.Instance.FUNDCODE.34 not triggering correctly. The rule was failing to to report records failing the rule. QR.C15051.EntryProfile.PARED.5 Displaying codes 7 and 8 (No Response Given/Information Refused). The labels are incorrect and should read 'No response given/don't know'. QR.C15051.EntryProfile.POSTCODE.9 triggering incorrectly when DOMICILE = XK is returned. XFTE01 not deriving correctly. This impacts the Data Supply report but also the Module.COSTCN exception rules. QR.C15051.Module.TINST.15 .not calculating the count of instances correctly. QR.C15051.Module.TINST.14 .not calculating the count of instances correctly. QR.C15051.Module.TINST.13 .not calculating the count of instances correctly. QR.C15051.Instance.GROSSFEE.18 using incorrect look up data. QR.C15051.REFData.COLPROV.2 not triggering for all records that fail the rule. QR.C15051.Instance.GROSSFEE.24 calculating the anniversary of the commencement date incorrectly. QR.C15051.Course.AWARDBOD.6 is triggering erroneously for constituent colleges of the University of London. QR.C15051.Instance.NETFEE.7 is missing a clause to exclude instances where MODE = 63/64. XQLEV501, XQLEV601 & XQLEV701 not deriving correctly. QR.C15051.Instance.LearnerEmploymentStatus.1 is triggering incorrectly where Student.BIRTHDTE= < 19. QR.C15051.Course.FEQAIMC.6 is triggering incorrectly where not all associated Instance have Instance.FESTUMK=2. QR.C15051.Instance.TYPEYR.7 is triggering for students where Instance.TYPEYR does not equal 1 or Course.COURSEAIM does not begin D or L, the rule should not trigger for these students..
QR.C15051.Instance.MCDATE.15 (Where exists and is not null, Instance.MCDATE must be equal to or later than Instance.COLFROMDATE) is triggering incorrectly. QR.C15051.QualificationsAwarded.QUAL.8 is triggering incorrectly for Instances where QualificationsAwarded.QUAL= H12. H12 is a valid QUAL code for CLASS codes 01-11. When viewing the Quality Rules report for an historic transaction, the individual records triggering each rule are currently not being displayed. The record details are available in the XML and CSV downloads of historical reports so these can be used instead of the on screen report whilst we look to correct the issue. QR.C15051.Instance.RSNEND.3 (Instance.RSNEND should exist where Qualification Awarded.QUAL exists unless Instance.INTERCALATE = 01) is triggering incorrectly. QR.C15051.LearnerEmploymentStatus.EmploymentStatusMonitoring.1 triggering where EMPSTAT = 12. QR.Instance.INITIATIVES.31 is triggering incorrectly for providers in Northern Ireland where Instance.Initiatives = K.
QR.Instance.INITIATIVES.33 is triggering incorrectly for Instances with Instance.INITIATIVES not equal to A.
QR.Instance.INITIATIVES.32 is triggering incorrectly for Instances with Instance.INITIATIVES not equal to A.
QR.Module.MODLANG.2 not triggering when conditions of the rule have been met. QR.Instance.INITIATIVES.15 is not triggering where 0 records have been returned with Instance.INITIATIVES= A. The new QualificationsOnEntry.QUALSBJ codes added to the schema are not recognised by the kit. QR.C15051.REFData.UOA2014.2 is triggering when conditions of the rule have not been met. This release includes an update to the XPDLHE02 derived field which will impact those providers with sequential research supervision and any students with multiple instances eligible for the same survey population. Those providers affected by this issue have been contacted directly by the Liaison team. Additionally, for those providers with sequential research supervision the Expected Instance Population report has been updated to include a new section containing the entry profile information for those students being transferred in. 28 11 November 2016 This release includes a new report, 'PGR transfers in' which is designed to assist those providers with sequential PGR supervision arrangements with the handover of reporting responsibilities for students. 28a 01 November 2016 This release includes an update to the sign-off form to correct the deadline for sign-off which was incorrectly showing as 15 November. The correct, published, date is 3 November. The remaining Check doc tables, such as the Campus information sheet, cost centre breakdown by level and fundcode and two table for providers in Wales relating to the proportion on modules taught in Welsh. A full reprocess will take place following this release and you are advised to review the amended reports. Plus updates to the tables DLHE1, ITT1 and WAIV2. A number of fixes have been released to known issues. Testing of the NSS report with HEFCE is continuing however we hope to be able to release this shortly. 23 05 September 2016 This release addresses a number of bugs raised during the collection - please see the Known Issues page for further details. 23a 25 August 2016 This release addresses a number of bugs raised during the collection. All data has been reprocessed and we would advise that you review the updated outputs for the Quality rules report and Data Supply. Commit option made available on the data collection system. QiW (Qualifications in Wales) data used in validation has been updated. RCUK look up data updated. The following Quality rules have been updated. The following Quality rules have been amended. In addition the OFFA look up data has been updated. This affects a number of quality rules surrounding Instance.GROSSFEE.A further set of Credibility tables have been released:STAT1, STAT2, STAT3, MOD1, FIN1, RCUK1, RCUK2, TTACCOM1, ETHNIC1 and DISAB.1. Completion status: England, Wales and Northern Ireland (COMP1P). The majority of these tables are replacements for tables previously in Check Documentation however the WAIV1 and WAIV2 tables are new tables for providers in Wales to cover the two new data items Instance.FEEWAIVETYPE and Instance.FEEWAIVEAMT. The chapter structure has been revised this year to remove the 'New data items' chapter and introduce five new chapters: 'Funding', 'Student attributes', 'Module', 'PGR' and 'Health and social care'. A mapping document will be made available on the coding manual shortly. There are also a series of rules that will be replacing some of the checks made previously against the Cost Centre Analysis table. A Cost Centre Analysis table will be released shortly to provide context to the rules and assist you with quality assurance and analysis. A suite of fields have been added to the 2015/16 Student record to record collaborative research supervision arrangements between providers. To assist providers in ensuring that these arrangements are reported correctly we will be producing a series of reports. The first of these reports, 'PGR transfers out' is now available. This report details the students that have been reported under a sequential arrangement and for whom responsibility is being passed from the reporting provider to a partner organisation. The Data Supply report is now available for providers to access. As last year the report contains 10 tables that can be downloaded in either CSV or XML format and contain the raw data submitted by the provider as well as the derived fields applied by HESA. We plan to add in functionality to enable providers to download all tables in a single zip file in a future release. One new business rule has been introduced at the request of the NCTL - QR.C15051.Instance.TREFNO.6. A further 168 exception rules have been carried forward from 2014/15. These can be found in the quality rules page on the coding manual. The majority of the additional and amended rules relate to the changes to the record for recording collaborative supervision arrangements. QR.C15051.Student.SSN.7 - For providers in England and Northern Ireland, no Student.SSN has been returned for more than 80% of instances where (Course.COURSEAIM begins H, I, J or C (excluding codes H60, H61, H62, I60, I61 and those ending with 90 or 99) or is M22, M26 or M28) and (Instance.MODE = 31) and Instance.FEEELIG = 1 and (Instance.FUNDCODE = 1 or 7). QR.Instance.DISALL.5 – will be amended to include a restriction on Student.NATION =GB. Additionally there are several rules that uses look up/reference data that are not yet available. These rules will be carried forward with no changes to the specification from 2014/15 other than the change to the look up data. We will endeavour to release the majority of these rules outstanding rules in the next release (19) but there may be rules with lookup data that is not yet available. An update has also been made to the UKRLP look up that is used to validate fields such as Module.TINST and EntryProfile.PREVINST. Providers previously failing validation on rules relating to UKPRNs that were not in the look up may now pass validation. In addition there has been a lot of behind the scenes work to prepare more business stage rules for release in the next development window and to create the framework for the exception stage rules that will follow. The 'Data Collection Student Admin' role can now be requested in the Identity System. This role allows the user to grant the Submitter, Guest and Query roles to other colleagues within the organisation. Work on the AMAL tool has also been completed and this will be released in the next week. This release also includes an update to QR.C15051.Instance.INITIATIVES.33 to fix issue 14225 and a correction for the country specific validation for the Open University. Release of the new Identity System role 'Student COLPROV contact'. This role enables users to view role holders at other providers and is intended to assist providers in managing the reporting of collaborative postgraduate research supervision arrangements. Each provider can have up to three contacts and access is governed by the Student record contact. This release also includes an improvement to processing times for files submitted on the data collection system.This improvement will be most apparent for large files and has seen processing times one aspect of the process chain reduced from six hours to three minutes for the largest file currently uploaded. We anticipate making further improvements over the coming months which you will hopefully see the benefit of soon. The DLHE survey population report. An update to the validation kit to include the two new QualificationsOnEntry.QUALGRADE codes PA* and Absent. This section contains information about the planned system releases for the next few months. Please note that this information is subject to change and therefore should not taken as a guarantee. This page will be updated with more detailed information as we get closer to the date. There are no more planned releases for C15051.